The breast milk or formula that comforts and nourishes your baby can also cause severe tooth decay. Most parents I talk to don’t know how to care for their babies’ teeth. The result can be the dramatically severe rotten teeth known as baby bottle tooth decay (BBTD). Who gets baby bottle tooth decay? 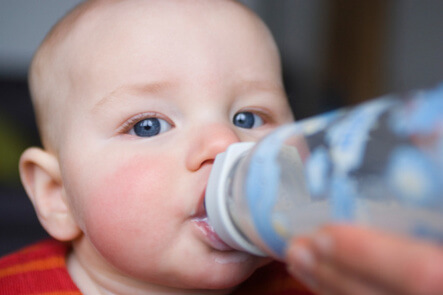 Baby bottle tooth decay can also occur while awake if a child is allowed to walk around with a bottle. Unlike adult cavities, which are usually hidden from view, baby tooth decay strikes the most visible portion of the front teeth. But parents are lulled into complacency because during the months the teeth are gradually weakening, the damage is invisible. Once the protective tooth enamel has been breached, the ugly process of decay accelerates. Is baby bottle tooth decay contagious? How long does baby bottle tooth decay last? The teeth remain damaged until they are replaced by permanent teeth. This tooth decay may not seem like a big deal, but these are the only teeth your baby will have during the years when much of the personality and self-image are formed. How is baby bottle tooth decay diagnosed? Early tooth decay can be observed by careful inspection. The remaining blackened stubs of the rotten teeth of late baby bottle tooth decay are clearly visible from a distance. Baby bottle tooth decay is treated by a dentist. Sometimes extensive dental work is needed, requiring restraint, sedation, or even general anesthesia. How can baby bottle tooth decay be prevented? Tooth decay can be prevented both by strengthening the enamel and by reducing prolonged exposure to acids. Moving the feeding time forward so that your baby is awake for even fifteen minutes after finishing can significantly protect the teeth. This is easy advice to give, but in some families, it can be very difficult to follow. Some babies enjoy the comfort of sucking to soothe themselves to sleep. An orthodontic pacifier or a bottle of water may soothe them immediately before drifting off. But for many babies, the act of feeding is the only way they become drowsy enough to slip off to sleep. Gently brushing the teeth becomes extremely important for these children. If the cleaning is done during deep sleep, when the baby is limp and not moving, the child is unlikely to awaken, and the teeth are rescued from hours of decay. This should be done whenever a child falls asleep within 15 minutes of feeding. The American Academy of Pediatrics wisely recommends that parents only give bottles during feedings and not allow their children to carry a bottle between meals. I also applaud the American Academy of Pediatric Dentistry’s recommendation to start cleaning babies’ teeth at least once a day as soon as the teeth come in – if not before! Gently cleaning your baby’s gums can help prevent gum disease later on and can help soothe your baby’s gums while teething. Once the teeth come in, use a tiny dab of baby tooth cleanser on a soft infant toothbrush or on some soft gauze.